If you've made the decision to sell your New Jersey home, our real estate agents are at the top of their game to get your property sold -- with the least inconvenience to you, for the most amount of money and in the least amount of time! 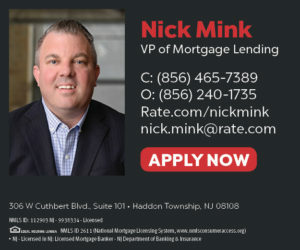 In addition to our great reputation and experience and knowledge of what buyers in the South Jersey region are looking for in a property, we also have the exposure you need to put your property in front of the right people! YOU CONTROL 4 OF THESE! Since the housing market is ever changing, you may not be clear on the value of your home. CLICK HERE for a personal home analysis. Innovative sales strategies are crucial in today’s marketplace, which is why we break the traditional real estate model with our 2.9% commission rate (when you use us as your dual agent), translating to substantial savings for sellers! 3.9%* when you sell with us! Our services include: professional photography, assistance with staging, home tours and listings on major online platforms. In addition, if your home is not sold in 30 days, you’re free to stick with us or re-market your home as you see fit. We know exactly what buyers are looking for and have the expertise and exposure you need to help you properly position your property in the current real estate market. *3.9% commission is divided as follows: 1.4% to Herron Real Estate as your listing agent (there is a $4,000 minimum charge) and 2.5% to the Buyer's agent.